GIVE LOVE, GET LOVE THIS VALENTINE'S DAY. SAVE 20% WHEN YOU SPEND $600 USE CODE: LOVE20. SAVE 25% WHEN YOU SPEND $1500 USE CODE: LOVE25. Your modern essential - part of your everyday upscale uniform that you’ll never want to take off, 14K reclaimed solid gold for strength and daily wearability. KBH Jewels believes that all women are wonder women - 14K reclaimed solid gold for strength, can be worn alone or as a stack. The edgy counterpart to your elevated basic stud - two flawless 1/4 carat diamonds lead down to a diamond accented beaded spike, 14K reclaimed solid gold for strength. A conscious classic in 14K reclaimed solid gold for strength and daily wearability. 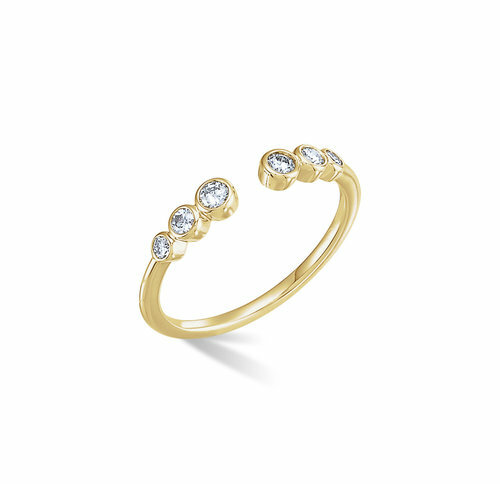 11 times the sparkle with 1/4 carat sized diamonds and 14K reclaimed solid gold for strength and daily wearability. Exceptional and exacting craftsmanship are on display with 60 handset grown diamonds on solid 14K reclaimed wire for strength. All - around sustainable sparkle with 7 Bezels set 2In apart on 14K reclaimed solid gold for strength and daily wearability. Skilled craftsmanship shines in these intricately set modern bar earrings with an edgy, textured finish 14K reclaimed solid gold for strength and daily wearability. Strong, yet pretty - 14K reclaimed solid gold for strength and daily wearability, can be worn alone or as a stack. The bracelet that you will be proud to pass on. Your classic tennis bracelet made with cultivated diamonds. A KBH Jewels favorite for its classic silhouette and stunning sparkle - featuring diamonds all the way around with 14K reclaimed solid gold for strength and daily wearability, can be worn alone or as a stack. A little sparkle goes a long way, these are the every day meets special occasion hoops. Exceptional craftsmanship is on display with 13 bezel set diamonds on 12 in of solid 14K reclaimed wire for strength and wearability. 14K Magic. An elevated basic for your jewelry wardrobe that you'll never take off. Sustainable luxury is modern luxury with this new take on the classic lariat silhouette, 14K reclaimed solid gold for strength and daily wearability. Six 3mm bezel diamonds surround circular sustainability on the skinny bangle - 14K reclaimed solid gold for strength and wearability.